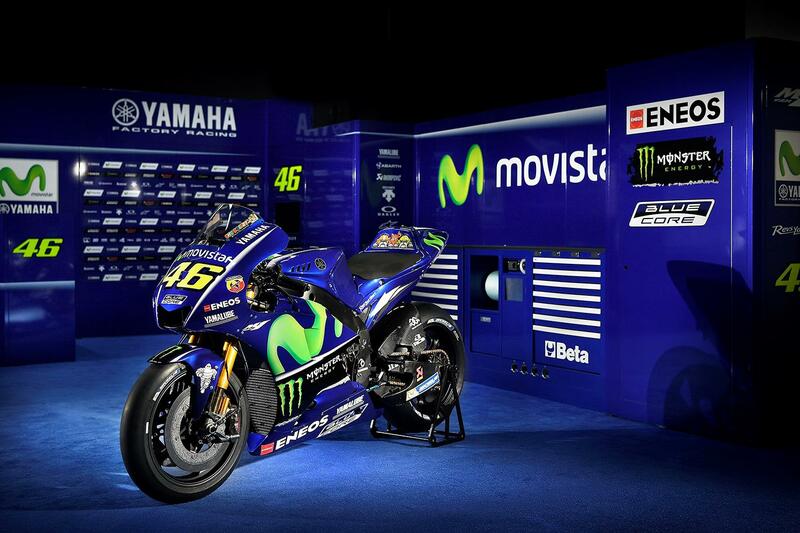 The Movistar Yamaha MotoGP team of Valentino Rossi and new signing Maverick Viñales have pulled the covers off their 2017 M1 colours in a ceremony at the Spanish television company’s Madrid headquarters. Modified slightly from the 2016 colours, the main modification to the design is a different shade of blue, bringing the bikes in line with Yamaha’s traditional darker blue as sported by their road-going R1 and R6 machines. Presenting the 2017 team were MotoGP’s Dylan Gray and Izaskun Ruiz, who welcomed to the stage by Rossi and Viñales for a Q&A session. They were later joined by General Manager of Motorsports Division & YMC MotoGP Group Leader, Kouichi Tsuji, Managing Director of Yamaha Motor Racing, Lin Jarvis, and Movistar Yamaha MotoGP’s Team Director, Massimo Meregalli, who insist that despite visual similarities to the 2016 machine, it hides an almost-entirely new bike underneath. The event mark’s Viñales’ first appearance in Yamaha blue after his move from Suzuki at the end of the 2016 season, although he has already tested for the firm not only in public at the end-of-season Valencia test but also at a private test in Sepang alongside Rossi, topping both of them.